I tried to use the Hyper-V Manager client on my Windows 10 PC to connect to my Hyper-V host unsuccessfully. It seemed no matter what I tried, I ran into various issues trying to get my Windows 10 PC to authenticate to the Hyper-V host. I came across this TechNet article that inspired me to give local Hyper-V manager client a second chance. With a few changes, I was finally able get it working. 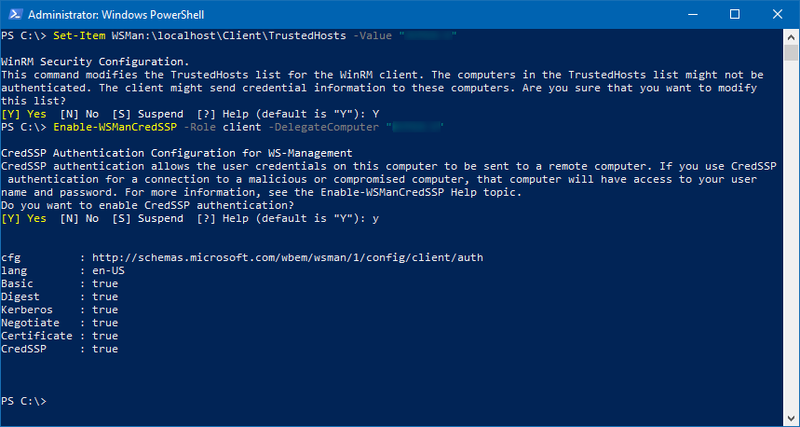 In this article I’ll show you how to remotely manage a Windows Server 2016 Hyper-V server from Windows 10. Press Y to confirm you want to enable CredSSP. Enable-PSRemoting Set-Item WSMan:\localhost\Client\TrustedHosts -Value "<server>" Enable-WSManCredSSP -Role client -DelegateComputer "<server>"
Enable-WSManCredSSP -Role client -DelegateComputer "<server>"
Now we must change the credential delegation settings on your computer to Allow delegating fresh credentials with NTLM-only server authentication. For this, open gpedit.msc to open the Local Group Policy Editor or if you work in a domain environment open the Group Policy Management Editor. 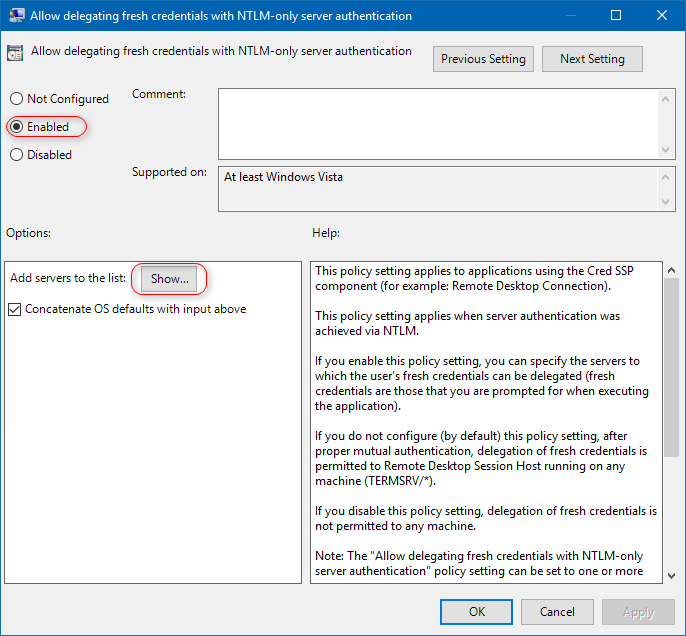 Navigate through Computer Configuration -> Policies -> Administrative Templates -> System -> Credential Delegation, and right click on “Allow delegating fresh credentials with NTLM-only server authentication” and select Edit. Select Enabled, then click the Show button. Type: wsman/<servername> where <servername> is the name of your Hyper-V host. When ready, click OK to close the list window and OK again to close the policy window. Start the Hyper-V Manager on your local computer. Click Connect to Server under Actions. Select Another Computer and type the name of your Hyper-V host. Check the “Connect as another user” box and then click Set User. 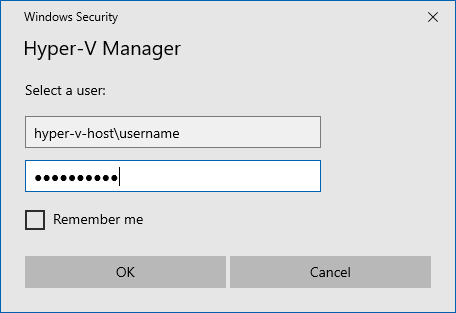 Type in hyper-v host\username and click OK. Check the “Connect as another user” box and then click Set User. 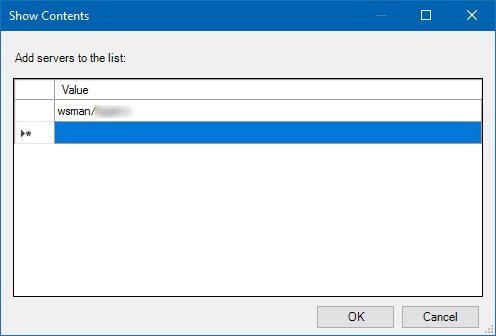 Type in the username in hyper-v-host\username. For example, “hyper-v\administrator”. Click OK on the Windows Security screen after entering an administrative user and password that exists on your Hyper-V server. Click OK on the Select Computer window to connect to your host. 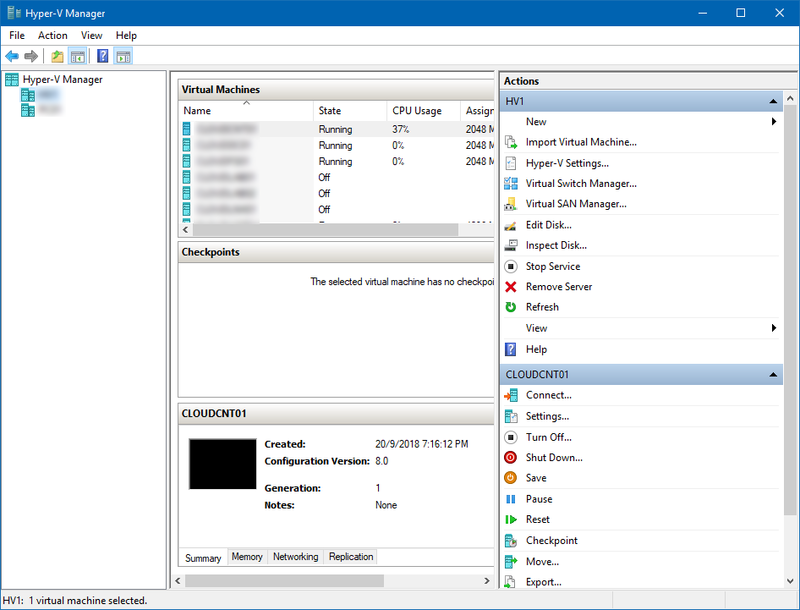 After a few seconds, you should see a list of your Hyper-V virtual servers. In this article I show you how to remotely manage a Windows Server 2016 Hyper-V server from Windows 10.